My husband likes to say the backup plan is more important than the actual plan. That came in handy when he was a TV newscast director and we’ve found it to be true for diabetes in action! This weekend we took the kids snow tubing. Slade and I grew up in New York, but our children are snow-deprived. The Charlotte area gets maybe 1-2 inches a year and rarely all at once. We’re more likely to get ice or slushy yuck. Once every couple of years, we get 3-4 inches all at once and the kids go bananas. Saturday, we bundled everyone up and headed off to the mountains. I packed two changes of clothes and extra socks and shoes for everyone. We don’t have actual winter clothes (no ski jackets or pants) and I assumed there’d be a lot of slush and wet and general yuck. I also threw in our diabetes bag. Benny carries his meter and a juice box wherever he goes. For the last few years, he’s used a leather pouch. It’s really a golf tee/supply bag, but it’s a great fit and Benny doesn’t feel like he’s carrying a purse! When we take a day trip or we’ll be out for a while, I throw a bigger diabetes bag in the car. This one can hold our pump supplies, extra strips, insulin, needles, etc. In the summer, I put the insulin vial in a Frio. Somehow, it all fits. A day outside in the mountains means stopping on the road for a big breakfast. Our kids love the Waffle House and I’ve resigned myself to eating there (I try not to watch the grease on the grill). After something smothered & covered, Slade and Benny figured out the carbs and Benny started to bolus. They both looked up at me with that “something’s wrong” look. “The pump says there’s only one unit left,” Slade said. What? How is that possible? Why didn’t the pump alarm go off? Oh wait…. 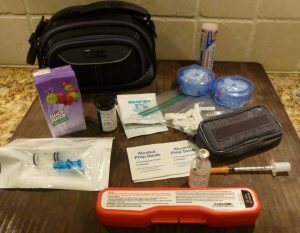 That’s when I remembered Benny waking up at 1am, stumbling into my room muttering, “My pump’s making noise.” The reminder alarm was going off, indicating the pump only had 10 units of insulin left. I confirmed the alarm (which turns it off) and told him we’d change the cartridge in the morning. Of course, in the morning all I remembered was that I was pretty tired for some reason. We paid the bill and walked to the car. I had the diabetes bag, so I knew we should be all set. But while I was reassuring Benny and Lea everything would be fine, I was trying to remember if I’d double checked the bag and if I could even remember the last time I’d reloaded everything. We were at least an hour from home and, I have to admit, I was nervous. But, it was all there. One quick cartridge change in the car, giant breakfast bolus and on our way to tubing (which reminds me, I really should put some extra pump tubing in the bag). I love it when a backup plan comes together.